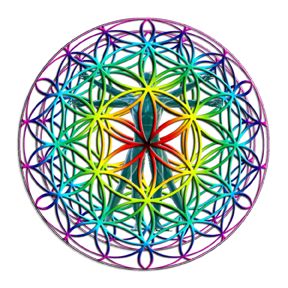 All the graphics are originally from the two volumes of the Ancient Secret of the Flower of Life (c) by Drunvalo Melchizedek, although I have altered them in many cases (for instance, I created the looping gif, and the multicolored Flower of Life sphere, and colored the merkaba positions). Sacred Geometry is not what you learned sophomore year of high school. This is something much different and much more fun. Sacred Geometry is the organizational basis of all that exists, has existed and will exist. Found within these patterns are both two and three dimensional shapes which carry archetypal memories. This is a very brief introduction to what Sacred Geometry is and how you can use these concepts to expand your consciousness. The basic form of sacred geometry is called the Flower of Life. It is a beautiful interlocking series of circles. Each circle’s circumference crosses other circles’ center points. You can draw the Flower of Life yourself, using a high quality compass. The basic steps look like this, with the finished product (usually illustrated with a double circle as a frame) in the lower right. The eye-shaped space in between each set of circles has its own meaning. One circle represents universal consciousness, the gold/solar source, and unchanging archetypes linked with, in the other circle, empirical consciousness, the silver/lunar reflection, and the changing realm of the senses, through the eye-shaped center that encompasses balanced human consciousness. The curved lines of the Flower of Life promote feminine, right-brained thinking. When you apply the straight lines of Metatron’s Cube (connecting all the centers), you add in the left-brained, masculine thinking. So if you need to concentrate more on one type of thinking or the other, or you feel unbalanced, you can meditate on either the curved shape, the straight line shape, or the combination. I call this Flower of LIfe figure “the mother of sacred geometry” because every important shape can be found within it, including the five Platonic Solids, named for the great Greek philosopher Plato. It is an ancient symbol which has been found all over the ancient world. The five Platonic Solids are the tetrahedron, the cube (hexahedron), the octahedron, the dodecahedron, and the icosahedron. If you have ever been involved with role-playing games, these will be familiar to you, as the shapes of the dice. To find the 5 shapes within the Flower of life, you extract a shape called Metatron’s Cube. You select these 13 circles from the Flower of Life shape—this is called the Fruit of Life—and then join all the centers with 78 straight lines to make Metatron’s Cube. This ancient shape, named for an angel, has been used to ward off evil and can be carried as a talisman. The 5 Platonic solids are ideal, primal models of crystal patterns that occur throughout the world of minerals in countless variations. These are the only five regular polyhedra, that is, the only five solids made from the same equilateral, equiangular polygons. They have the same face shape on every side and only 1 angle per edge. All other shapes have different faces and/or angles. Also, if you spin any of these 5 shapes around its center point, its corners will describe a perfect sphere. The Platonic Solids occur in the crystal world. Working with them connects us to nature and the higher realms of the cosmos, especially those attributes associated closely with each polyhedron. Each of these shapes has metaphysical properties, making them valuable tools for meditation and rituals. The Tetrahedron is the four-sided pyramid. Each side is a triangle. (The pyramids of Egypt, Central America & elsewhere are five sided pyramids--four sloping triangular sides and a flat square/rectangular base.) It represents the powers of manifestation & creation, the element of Fire, the color Red and the Solar Plexus (third) chakra. Can help you burn through problems. It is masculine. The Cube (Hexahedron) is the six-sided box. Each side is a square. It grounds the creation of the Tetrahedron into the physical realm. It represents the element of Earth, the color Green and the Base (first) chakra. Use for grounding. It is masculine. The Octahedron is the eight-sided diamond. Each side is a triangle. It represents love, the heart and compassion, integration, the 8-fold path to Enlightenment, the element of Air, the color yellow and the Heart (4th) chakra. It can help you move forward. It represents your inner child. The Dodecahedron is the twelve-sided ball with the pentagon faces. It represents the 12 faces of the God/dess within, Ascension, Mystery school teachings, the color Gold, the element Ether/Spirit and the higher chakras (8-12 and up). It connects you to the universal life force. It is female. love and compassion. Prayer is invoked in the form of the icosahedron. The twelve faces of 'God within' are discovered in the dodecahedron. Four of the five platonic solids embody the number thirteen. The cube and octahedron have twelve edges or lines surrounding one center. The icosahedron has twelve corners around one and the dodecahedron has twelve faces around one. The only solid not supporting this is the tetrahedron and when two tetrahedrons are joined (star tetrahedron) there are twelve edges around one. More about the star tetrahedron in a moment. There is a 6th mystical shape, also found within Metatron’s cube. This is the star tetrahedron, made up of 2 tetrahedrons. This powerful shape is also called a Merkaba. It is basically a 3 dimensional Star of David. It contains within it the geometry of the cube, the octahedron and the tetrahedron. The word Merkaba, in ancient Egyptian, is translated as MER: rotating fields of light, KA: spirit, and BA: soul and in Hebrew it means 'chariot'. Everyone knows about auras. You can get the colors of your aura photographed or looked at by a psychic. What a lot of people don’t know is that your aura is not really a shapeless blob. It’s the shape of a star tetrahedron. Three of them, actually. Stand up straight. Hold out your arms. Your static field is a hand’s width past the edge of your finger tips and the top point of that field is one hand’s width above your head and the bottom of that field is one hand’s width below your feet. These are your hands’ widths so for each person it’s slightly different. Running from top to bottom is a tube, the pranic tube, which carries energy from both earth and sky into your physical body. It is as big as the circle made by your thumb and forefinger. The top of the pranic tube is your soul star chakra, and the bottom of your pranic tube is your earth star chakra. These lead into your crown and root chakras (which also point straight up and down, unlike the other five, which point front and back). Your root and crown chakras are actually two ends of the same tube, and the energy running through it is changed as it passes the other 5 horizontal chakras. The alignment of the static star tetrahedron in your aura depends on your gender. If you are male, the point of the sun tetrahedron (yellow, in the drawing) is in front of you, the flat part behind you. If you are female, the flat part of the sun tetrahedron is in front of you and the point behind you. These star tetrahedrons do not rotate. They represent your physical body and are neutral. There are two more star tetrahedrons in your aura. 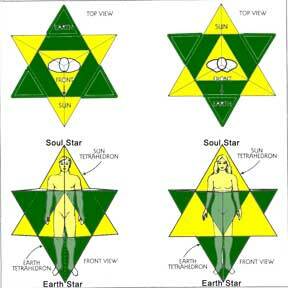 (The term “merkaba” refers to all 3 of these star tetrahedrons together.) One star tetrahedron is male and electrical in energy and it rotates counter clockwise (to the left), and relates to your mental/logical thinking. The other star tetrahedron is female and magnetic and it rotates clockwise (to the right) and relates to your emotional thinking. Meditating with the merkaba activates the left and right brain together, raising your consciousness level. It brings dualities into balance—male and female; heaven and earth; everything that is yin and that is yang. You can, with practice, use the Merkaba field to lift your consciousness to higher realms. When you meditate and use any kind of breathing method, you should be aware of the breath and energy going in through both ends of the pranic tube and meeting in your heart. It’s almost like pumping up your heart, it gets bigger and bigger with each breath until it explodes into light from all the combined energies of earth and sky. When you visualize that happening and you’re working with the merkaba, the ball of light that surrounds you should look like a flower of life sphere in rainbow colors. 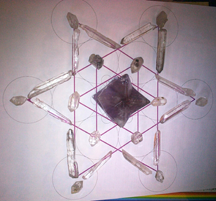 One of the many things you can do with all these wonderful shapes is make crystal grids. This is a layout of crystals chosen for a specific purpose, placed in sacred geometry-based patterns to connect, clear, amplify, generate and re-direct energy. Crystal grids help to better formulate and ground intent, then assist to spread and manifest the sole purpose of that intent. Working with crystals and sacred geometry together can raise our vibration, clear physical and emotional blockages, expand our perception and reconnect us with Source. You can use as the base the whole Flower of Life shape, and place a crystal on each line crossing. Or you can use a Metatron’s cube and concentrate on whichever of the Platonic Solid shapes (or the Star Tetrahedron) you feel the need to connect to. You can purchase sets of Platonic Solid crystal shapes and Star Tetrahedrons to use in the grids (or just hold the single shape you need). You can make permanent grids by gluing the crystals in place and keep them in your car or in certain places in your home, as needed. Build them with a clear intention and purpose in mind. Star Tetrahedron grids are multipurpose. If you want to concentrate energy, and bring energy in from above and below, point the crystals toward the center. If you want to spread energy over a large area, point the crystals outward. This is a quickie grid I put together for this lecture, using a star tetrahedron in Metatron's Cube. In the center is a large amethyst star tetrahedron (which is for sale! contact me) surrounded by long singing laser quartz crystals and small Herkimer-type quartz. No matter what shape you use, activate the grid in the same way. Join up all the crystals in the pattern you laid, using your finger, a special crystal, or a wand. Do it 3 or 9 times, concentrating on bringing energy in from above and below, and putting the energy toward whatever purpose you built the grid. If you know Reiki or anything similar use that energy as well to program and empower the grid. You can build them for healing yourself or for healing someone else, for protection, or any other positive thing you can think of. You can put a piece of paper under the grid with the person’s name or photo, or with your affirmation written out (always phrased in the present time, and with gratitude). You should recharge and empower the grid at least once a day until it has served its purpose and then take it apart, and cleanse the crystals, freeing them of the programming. I offer for sale sets of crystal Platonic solids and loose merkaba crystals of all sizes, from $10 up. There is no page for these; contact me if you're interested. All the fold-up Platonic Solid & star tetrahedron patterns below are (c) by Bruce Rawlins from his excellent Sacred Geometry Sourcebook, which I HIGHLY recommend. They are all PDFs requiring the free Adobe Reader.